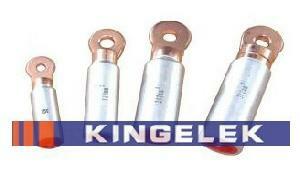 King electric co., Ltd has a full range of bi-metal lugs for most applications. welded from the highest quality aluminium (99.6%) and copper (99.9%). The aluminium barrels are chemically treated to reduce contact resistance and reduce corrosion. The barrels are filled with a jointing compound and capped. They should be crimped using standard aluminium dies. The table shows the standard range of stud holes; however, we can punch any hole you may require in blank lugs.